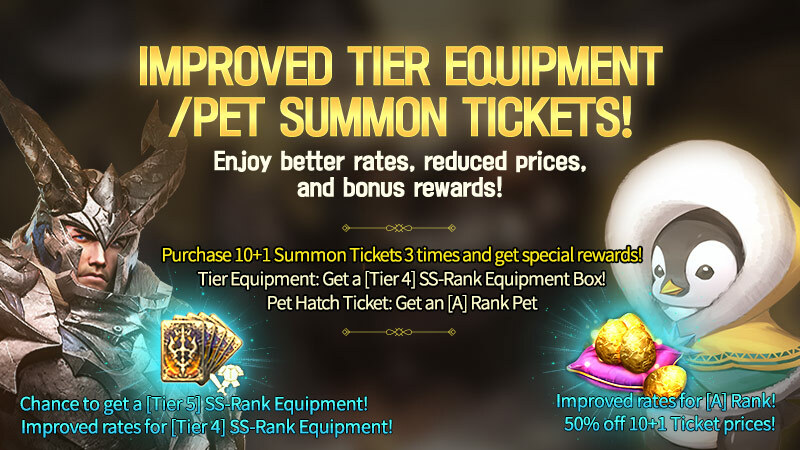 [Notice] Improved Tier Equipment/Pet Summon Tickets! Thread: [Notice] Improved Tier Equipment/Pet Summon Tickets! - Tier Equipment Summon Rates will be changed. - Purchase 10+1 Tier Equipment Summon Tickets 3 times and get a [Tier 4] SS-Rank Equipment. ㄴ Earn your reward by tapping [Claim] button at Summon Ticket page. - A Price for 10+1 Pet Hatch Tickets will be 50% off. - Pet Hatch Ticket Summon Rates will be changed. - Purchase 10+1 Pet Hatch Tickets 3 times and get an [A] Rank Pet Hatch Ticket. ㄴ Earn your reward by tapping [Claim] button at Hatch Ticket page. - Please check the notice [1/30 Patch Note Details] for more information. - These improvements will be applied after 1/30 Maintenance. - If there are any additional adjustments/changes, we will let you know with another notice.